John Snow was born Jan. 31, 1933 in a one-room cabin on the Stoney-Nakoda reserve in Morley, Alta., the fifth of 11 children born to Cora Bigstoney and Tom Snow. Just days after his birth, he was given his Native name by his great-grandfather, Hereditary Chief Jonas Goodstoney. He was named Intebeja Mani, or Walking Seal, after a creature that can adapt to all types of terrain and climates. Like his namesake, he spent his life adapting to the changes and challenges that came as part of the changing world around him. He was known by his Native name until he began attending the residential school in Morley run by the United Church of Canada. There he became known as John Snow, named in honor of his late uncle who had been killed in an accident years before. Snow attended residential school until he was 16, then returned home, where he learned to hunt and trap from his father and helped the family out by doing odd jobs. But what he truly wanted to do was to continue his education. In 1958 he enrolled at Cook Christian Training School in Phoenix, Arizona, an institution specializing in Indian education. He received his diploma in 1963, becoming the first member of the Stoney tribe to do so. He then returned to Alberta where he enrolled at St. Stephens Theological College in Edmonton. In 1963 he was ordained as a United Church minister. While he was attending school in Phoenix, Snow met a fellow student, Alva Townsend, a Quechan Indian from Yuma, Arizona. The couple married in 1960. Together they had seven children—John Jr., Rachel, Terry, Tony, Gloria, Billy and Theresa. Snow ministered to the Aboriginal communities of Carry the Kettle First Nation in Saskatchewan, the Apache and Pima First Nations in Phoenix and Goodfish Lake First Nation in Alberta before finally being assigned to minister to his home community in 1968. On his return to Morley it became clear very quickly to Snow that while he was gone the community had changed for the worse. He tried to speak to representatives from Indian and Northern Affairs Canada about the need to improve housing, education, medical services and employment opportunities on the reserve, but they told him they would only discuss the issues with elected officials. Undaunted, Snow ran for office in 1969 and was elected chief of the Wesley band, one of three bands that make up the Stoney Nation. He would serve in that position for 28 years, from 1969 to 1992, then again from 1996 until his retirement from politics in 2000. While Snow had sought political office to help the people of his own community, it wasn't long before events thrust him onto the national stage where he would work to help Aboriginal people from across the country. In 1969, Prime Minster Pierre Elliot Trudeau's Liberal government released its White Paper on federal Indian policy. Viewed by many Aboriginal people as a blueprint for their assimilation, the White Paper proposed elimination of any special status for the Indigenous populations in Canada. A handful of Alberta chiefs, Snow among them, countered the White Paper with their own Red Paper, which they presented to the House of Commons. Opposition to the White Paper continued to grow from that point on, and the government eventually scrapped their plans. Snow also dedicated much time and effort to protecting the treaty rights of First Nations people. In 1971 he was appointed the first director of the Indian Association of Alberta's Treaty and Aboriginal Rights Research program, where he began the process of researching the land claims and treaty rights of First Nations in Alberta. 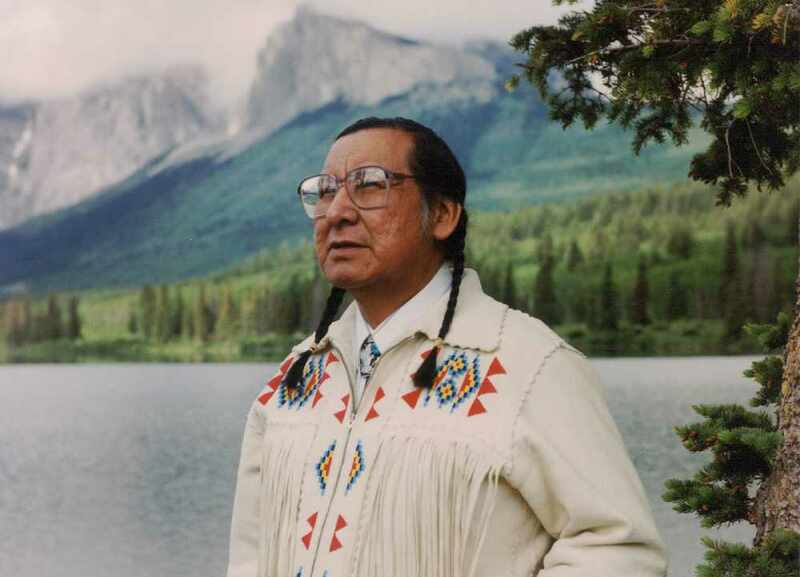 He negotiated two land claims for the Stoney people, the first in 1990, which saw the Stoney Nation receive $19.6 million in compensation for lands taken from the band to build the Ghost Lake hydroelectric dam, and another in 1999. Under his leadership, Morley gained a number of new facilities. In 1980 Snow established the Nakoda Conference Centre. Two years later, the Chief Goodstoney Rodeo Centre was built. The Nakoda Hotel followed in 1989. In addition to being a political leader, Snow was also a spiritual leader for his people. He was involved with the All Tribes Presbytery of the United Church and worked to show others that Christianity and Native Spirituality could co-exist. From 1971 to 1985 he hosted the North American Indian Ecumenical Conference, held in Stoney Indian Park. People from around the world would come to the annual conference, where Indigenous cultures, spirituality and traditions were taught and celebrated. Old ceremonies were renewed, culture was shared and Aboriginal people learned to be proud to be Aboriginal. Ensuring the people of his community had access to education was also a priority for Snow. In 1985 he helped establish community-controlled schooling in Morley. He was also a key player in bringing the World Indigenous Peoples Conference on Education to Morley in 2002 and often shared his knowledge and experience by making presentations to university and college students. That focus on education was something Snow and his wife imparted to children by stressing its importance and offering support and encouragement. As a result, all seven of their children not only graduated from high school but went on to post-secondary education as well. In 1977, Snow published These Mountains Are Our Sacred Places, a book that chronicles the story of the Stoney people, from before the coming of European settlers up to that present day. The book, written to coincide with the centenary of the signing of Treaty 7, was republished in 2005. In 1981, Snow was awarded an honorary doctorate of laws degree from the University of Calgary. In 1986, Cook College and Theological School in Tempe, Arizona bestowed upon him an honorary doctorate of divinity degree. On June 15, 2000, Snow's wife, Alva, passed away. Six years later to the day, Snow would join her. He died at his home in Morley on June 15. Those that knew him remember Snow as a humble man, an eloquent speaker and a man with endless patience. They also remember his boundless generosity. Prior to Snow's funeral, a wake was held at his home in Morley. A pipe ceremony was held and, at its conclusion, the people at the house looked outside and saw eight buffalo standing in the backyard. The buffalo had somehow managed to get out of their paddock and travel two miles through several fenced areas and across a highway to arrive in Snow's backyard. The buffalo were returned to their paddock, but the oldest male bull returned and throughout the wake could be seen walking at the bottom of the hill where Snow used to walk, staying near the old cabin where Snow did most of his writing. Snow's children believe the appearance of the buffalo was a sign from the Creator, sent to honor the passing of a great man.